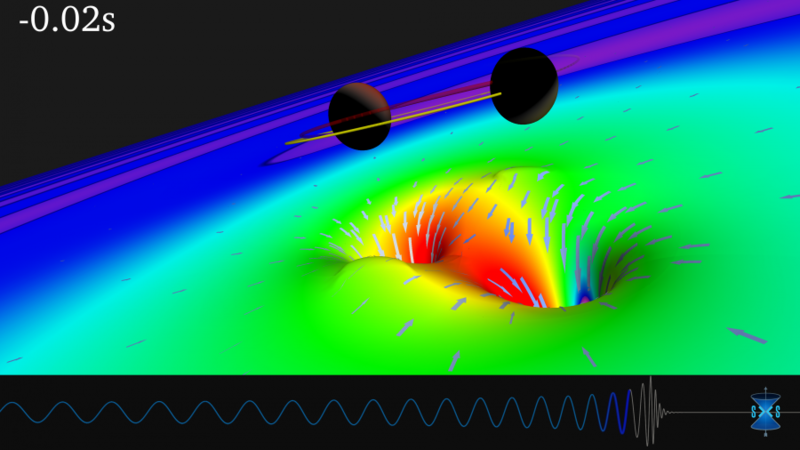 The Pegasus team is very happy to hear about LIGO’s incredible discovery: the first detection of gravitational waves from colliding black holes. We congratulate the entire LIGO Scientific Collaboration and the Virgo Collaboration on this incredible achievement. The Pegasus team is very pleased to have contributed to LIGO’s software infrastructure. 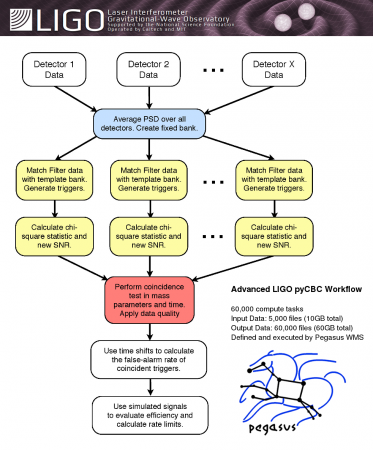 One of the main analysis pipelines used by LIGO to detect the gravitational wave was executed using Pegasus Workflow Management System (WMS). The PyCBC analysis pipeline analyzed data from the two LIGO detectors. Initially the analysis was managed by Pegasus WMS on the LIGO Data Grid. LIGO extended their computations to the nation-wide cyber-infrastructures, Open Science Grid and XSEDE. Pegasus aided this expansion by managing cross-site data transfers and computations in a reliable, scalable, and efficient manner. Pegasus enables LIGO researchers to easily monitor and analyze their workflows via a web based dashboard, and a suite of command line tools. “We use large, complex workflows to search for gravitational waves with LIGO. Pegasus makes it faster and simpler to run our codes, which lets us concentrate on the new discoveries and new science.” explains Dr. Duncan Brown, a physicist at Syracuse University. Pegasus WMS is a collaboration between the Science Automation Technologies Group at the University of Southern California’s Information Sciences Institute and the HTCondor group at the University of Wisconsin, Madison. Pegasus’ collaboration with LIGO dates back to 2001. The workflow technologies that underlie the PyCBC search were first described in the book “Workflows for eScience” co-edited by ISI’s Ewa Deelman. Thanks to the National Science Foundation we have been able to sustain our collaboration for over 15 years, most recently through a joint NSF Data Infrastructure Building Blocks (DIBBS ACI-1443047) award and a Software Infrastructure for Sustained Innovation ( SI2-SSI ACI-1148515 ) award. Pegasus over the years has received funding from the National Science Foundation through the following grants: SI2-SSI ACI-1148515, ACI-1443047, ACI-0943705, and ACI-0722019. 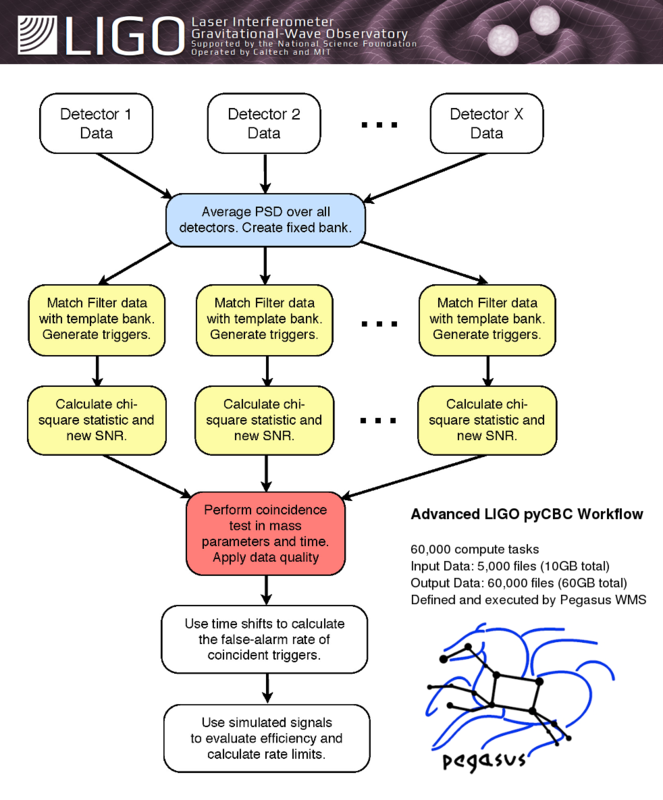 Research in Pegasus workflow performance modeling is supported by the Department of Energy through DE-SC0012636. Pegasus is being used in the following NIH-funded projects: NIMH Repository and Genomics Resource (NIMH-RGR), Population Architecture using Genomics and Epidemiology (PAGE) and Genome Sequencing Informatics Tools (GS-IT).